I do not think Turkey is bound by CITES regulations as it is not part of EU. I have just read on BBC website that the UK is embracing herself for the hottest day of the last ten years. My thoughts are with my fish tank. Although I had set up cooling fans connected to temperature probes, I cannot help worrying. I normally keep my tank water quite warm during the winter months in preparation for this sort of event, so that any further rise in temperature will not create any shock to my corals. So far it has worked, but whether it will work this time is yet to be seen. I hope your tank is ok...my tank got upto 28.2C yesterday; air cooling wasnt enough. My living room was like 32C. My corals were all fine. Today is a little milder, but I put two frozen bottles of water in the sump this morning in any event. I came back to Sheffield last Sunday. Both my fishes and corals appeared to be very well looked after by my neighbour. God bless him. In fact, coral coloration has somewhat improved during my absence . My test kits have been calibrated using FM Multi-reference solution. Here are the latest photos, which I have just taken. The sea star belongs to the Agean sea. I found it at about 15 meter depth. I put it back to the exact spot I found it shortly after taking its photo. everything looks fantastic! I know I subscribed to this thread once, but apparently I had to do it again. Glad everything went well while you were away Bulent You're lucky to have someone you can trust to keep your babies safe mate. I'd be pretty happy to come home to this any day of the week. Wow, your reef is looking great! Thanks Andrew. It is nice to know that I can depend on my good old neighbour who is very meticulous in what he does. He took detailed notes of his actions. I was very impressed with him. Nice fish catch Bulent. Sorry about the seal. What is "BFC"? I am sure it is something very obvious. I am not very good at abbreviations. My biggest fear was to hook the bloody seal as it was chasing my catches and grabbing them while retrieving. I could feel the extra tension on the line. Regarding blood, an air riffle came to mind first, but then again I did not want to get arrested. It is difficult to estimate the net volume (US gallons) of the display tank. For this reason, I will provide a range of values. These numbers will get higher as I am planning to introduce another Genicanthus sp (G. wanatabei female) in due course. Last edited by DiscusHeckel; 07/14/2015 at 03:31 AM. 65 gal divided by 10 = 6.5 You have 10 fish so 10 divided by 6.5 = a BFC of 1.53. That's an excellent number Bulent but just under mine at 1.57 - as long as the number is over 1.00 you have a good fish poo supply for SPS habitation. 65 (US) gallon is my net overall volume, including sump. Whereas in my calculation I used my display tank's net volume as you mentioned "display tank volume" in your request. Furthermore, I only have six fishes at present. My seventh fish, Bartlett's anthias, died shortly before going on holiday. I cannot keep anthias in long term despite feeding them at least three times a day. Having said that I was successful with Pseudanthias bimaculatus in my previous tank. Finally, I find your metric quite intriguing. Have you worked out empirically what the upper limit ought to be? Wow Bulent! Tank is looking awesome buddy, keep doing whatever your doing coz it's working! We aren't worrying about rock and coral volumes Bulent. 6 fish divided by 6.5 = 0.92.
he's trying to make lifelong friends everywhere he goes but he's really just annoying everybody!! Bulent, i just read your whole thread.. Very nice system and beautiful big colonies. I love your reasoned and methodical approach to reef husbandry.. I'm glad you have beaten your cyano problem. I've always loosely shot for the redfield ratio of 16 to 1 for n to p ratio.. ten to one is certainly in the ball park.. having said that, using biopellets, cheato fuge and remote dsb, i have a 1ppm nitrate and .o6 p which is a pretty good ratio and i still have a bit of cyano. i will be following your experiences with interest. This gives me a good excuse to go and get a few more fishes then. I like empirical research. I won't be surprised if "BFC" is widely cited in the mainstream reef literature in the future . However, Biggles' metric may require some fine tuning as poo contribution to a reef tank and its frequency vary from one species to another. I think Sahin has already made a similar comment. Thank you for your kind words and taking time to read my rambling. Unfortunately, to my disappointment cyanobacteria made a comeback a few months after writing my cyano post last year and never left ever since. Having failed on my methodology, I have turned my attention to proprietary products that claim to tackle cyanobacteria, such as KZ coral snow and KZ zeobak/cyano clean. Although they have not eradicated cyano, they have reduced the frequency of its reappearance after its removal from sand bed and/or rocks. I love the ramblings, keep it up! I am going to try Scotty's tube combination first. Having watched his reef videos on big HD screen on numerous occasions, I got convinced that I will like it. I ordered enough tubes to go back to my present combination if needed. Regardless of what I am going to have, there is likely to be an actinic tube in my combination. I am now hoping that the German retailer will send the right tubes and that tubes will arrive in one piece. To offset part of the purchase cost, I sold a few frags today to local reefers and impressed my wife during this process. She seems to think that I have a good business prowess. I said thank you dear... Acropora yongei seems to be more popular than Acropora aspera and copiosa though. The "green/blue" Acropora turaki, which we we talked about a few weeks ago, is now sold as "Bottle-brush" acropora by Reefworks. I wrote to Clayton after recognising the picture of the blue "acropora turaki" colony on his web site and ask for explanation. His reply was as follows: "the bottle brush Acropora advertised is the one we previously called A. turaki. However we are not calling it Turaki any more as I believe it was a misidentification. A turaki we get in from Java, it has slightly larger tubular coralites but is very similar looking but I believe a different species." In fact, this coral has always been Acropora carduus :doh:. Do you have the new T5 tubes yet Bulent ? Not yet. They were posted yesterday from Hannover, Germany. They should be with me either today or tomorrow at the latest. I replaced my existing tubes exactly 9 months and 10 days ago. My tubes arrived last week from Germany in one piece. These readings look OK to me. 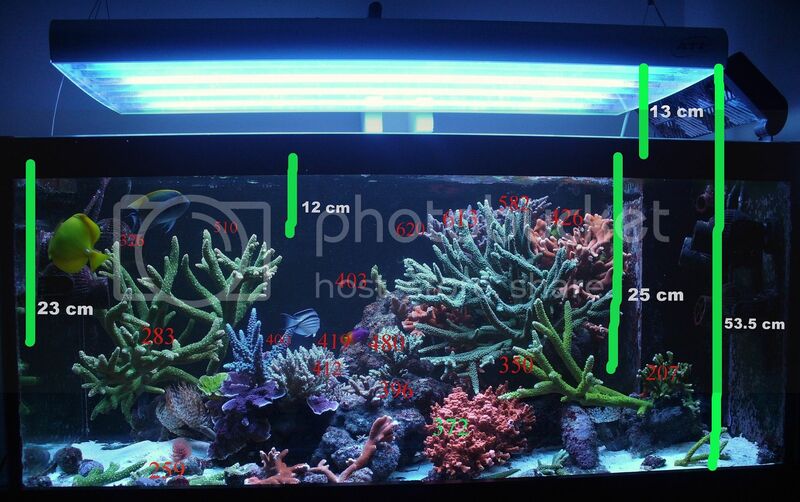 Because coloration of my corals are constantly improving and growth is rampant, I cannot justify tube replacement. Do you, the SPS boffins, agree? PS. Coral fragments on sand bed are going to my lfs on Friday. They will partly finance the purchase of a Genicanthus Watanabei.